Despite being known best in the commercial market for handguns, Star's primary business has been in many ways their military submachine guns. The fall of the SMG in the 1980s to the 5.56 mm carbine may even have been a contributing cause of their eventual demise. 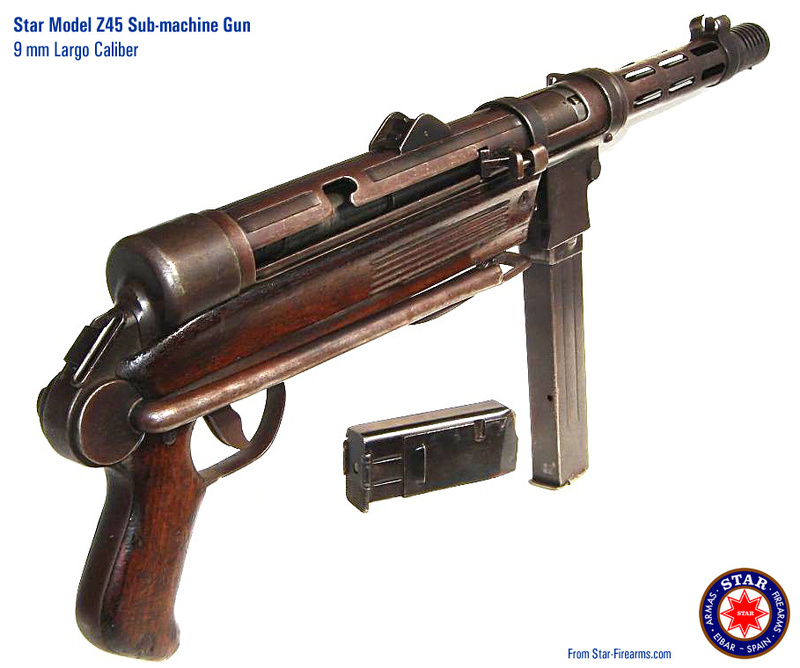 While Star had by the end of World War 2 been making SMGs for over a decade, and had been a successful supplier of handguns to a number of military forces since the first World War, the Z45 was their first real success in this field, and was the standard Spanish Army SMG for almost twenty years, until replaced by the Z62/63 series of Star SMGs. Classic series Star handguns are constantly referred to as Colt 1911 copies, or clones. In the same way, the Z-45 is almost always described as a simple Spanish copy of the German MP 40 SMG. Of course this is also very untrue. While they have familial similarities, and a few key features â€” such as the knob on the bottom of the stock for disassembly – are shared, they are in no way the same gun. No parts even appear to be interchangeable between the two guns. They are in fact so different I am not going to be bothering enumerating all the differences, but you can see many of them with a cursory examination of the photo below of the two sitting next to each other at the Royal Armories. 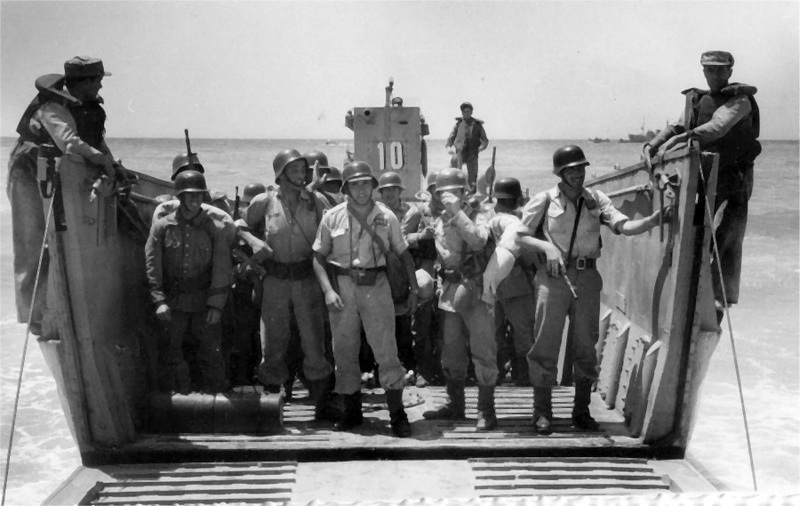 Jesus Alvarez, who served in the Spanish Army some time back, tells us that he handled the Z-45 on a number of occasions. Every version he saw was equipped with the folding stock, and he notes that all the guns were blued, not black or parkerized. The ventillated handguard over the barrel is of very high quality, and they are always equipped with 30-round magazines. This seems to have been a high quality, almost first-generation sub-machine gun, in the sense of the original Thompson. They are all well-finished, have decent sights with some adjustment, have excessive machining of parts that don't really need it, and all seem to be equipped with a muzzle compensator. First soldier at the right holds a Z45 in his right shoulder, in the Sidi Ifni war, 1957-58, northwest Africa. Z-45 folding stock SMG with the issued green canvas sling. The Z-45 is a second generation, straight-blowback, open-bolt, selective-fire SMG of conventional general layout. A pistol grip is at the extreme rear of the receiver section, notch sights are mounted to the top of the receiver and a blade at the end of the barrel, and a box magazine protrudes from the bottom of the front end of the receiver. It is however a strangely high quality gun, designed in the style of the second generation of stamped/tube SMGs, but with numerous machining operations and otherwise the finish quality of a first generation, pre-war gun. All seem to be equipped with a muzzle compensator, and have a an usual, easily-removable barrel. Two sling loops are provided, one at the rear of the receiver, and a rotating oneâ€”allowing either left or right side useâ€”sticking out the side of the gun between the barrel and receiver. The stocks and grip are all mounted to a complex, machined steel and contoured wooden stock/gripframe which encloses the lockwork, in much the manner of a bolt action rifle. This gripframe is attached to the gun by a notch at the rear, and a crossbolt near the front. The crossbolt is unscrewed and removed with a tool, then the knurled knob below the gripframe pulled out and the entire gripframe can be pulled straight down and away from the receiver. Two different gripframes exist. The most common is for the folding stocked gun, which includes a steel protrusion at the rear with provision to mount the folding stock mechanism, as well as a sling loop. This gripframe also has a protrusion for the pistol grip, to which sideplates of wood or, more often, checkered plastic are attached by screws at the extreme top and bottom of each sidepanel. These side panels are similar to those found on many Star pistols, even to include the Star logo. 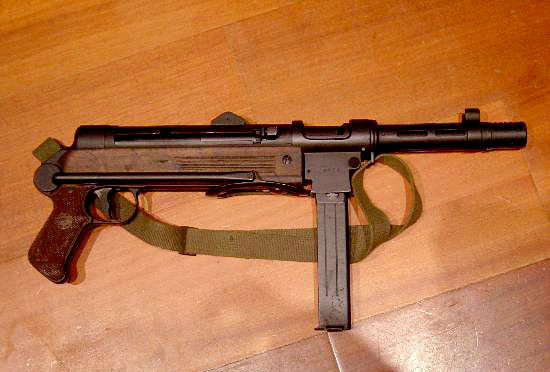 More rare, but still made and issued, is a fixed stock Z-45 gripframe. In this case, the sideplates for the gripframe below the receiver are contiguous with a solid wood buttstock and grip, much along the lines of the Spanish issue Mausers. There is no grip cap, and only a thin plastic buttpad. The bottom of the gripframe is steel along the entire length from the machined trigger guard, to the magwell in both configurations. The folding stock mechanism is, unlike even the similar-looking stripping knob, notably similar to the MP40, which is not surprising as it was also largely copied for the AK-47 and derivatives, remaining in use until this century. The forearm is a perforated steel sleeve with no wood or plastic panels. It is very heavy and sturdy. Since all the -35 series guns now seem to have badly dented ones, I'd guess Star engineers, learned their lesson and beefed this one up to deal with real world use. Probably the most unusual, and inexplicable, feature of the Z-45 is the removable barrel. 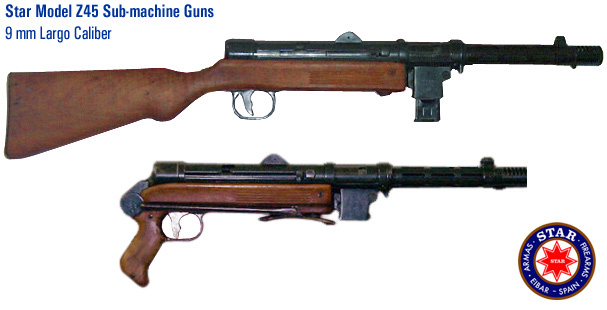 While a number of carbines and SMGs had easily removable barrels, this was always at least nominally for paratrooper, survival or other operations where making the gun more compact was helpful. The Z-45 on the other hand acts more like they expect it to be a belt fed machine gun. The barrel shroud does not come off without armorers tools, so the gun is no more compact with the barrel removed. This also precludes the use of alternative systems such as suppressors in place of the barrel. So, it remains a mystery why Star went to the effort of building this complex extra functionality. To remove the barrel, press in on the grooved button below the muzzle device. The yellowish metal strip in front of the button is a spring you will push against. When the button clears the notch in the ring behind, the muzzle device &ndsh; and the entire barrel – can then be rotated 90° to unlock from the rear and pulled out the front. The bolt is where classifying the Z45 gets even more complex, as it has a rather clever stepped and overlapping bolt, with the bolt face well back from the front end of the bolt mass. This is a feature generally first ascribed to the UZI, though it appeared on several guns before this. It can provide some safety for misfires in advance primer ignition systems or for misfeeds, in that the large steel bolt largely encloses the cartridge, but is mostly to bring the bolt mass forward to more efficiently use space. However, the Z-45 somehow doesn't get any of these advantages, and is still a very long gun, with a very long bolt, so it is not clear why it has this design. An even more unusual feature of the Z-45 is the charging handle. While it is apparently a conventional reciprocating lever, there is a clever safety feature built into the lever. Unlike the very safe, but excessively complex features on the -35 series, this is also studiously simple, reliable, and easy to make. When forward, pulling the charging handle will do nothing as it is locked by a latch which springs up into a cutout in the receiver walls. To move the cocking handle, squeeze the charging handle then pull to the rear. This prevents a loaded but bolt-forward gun from discharging by dropping or snagging, a common issue with early early and simple SMGs. Many other designs safed a loaded gun by disabling the gun with features like the folding magazine on the French MAT-49. 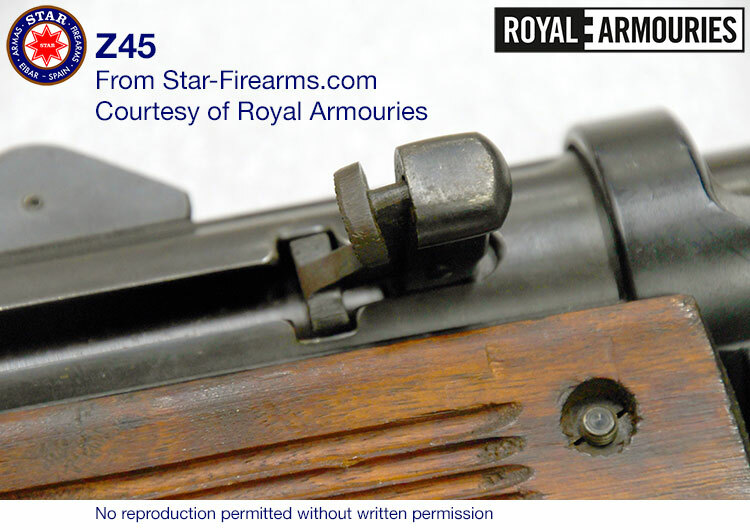 The Z-45 feature was simple, reliable, and automatically engaged so very safe. It is odd it was not used later by Star or others. As on many SMGs, there is also a notch at the rear to manually lock the bolt open, in a non-firing position as well. The charging handle is on the right side of the gun, for no clear reason. This makes the gun harder to manipulate, and while it could reduce stamping costs on some configurations, has no clear manufacturing reason on this design. Star SMGs are pretty much always select fire, which in the post-war era of simplified second generation guns, not just interesting but extraordinary, and nearly unprecedented. 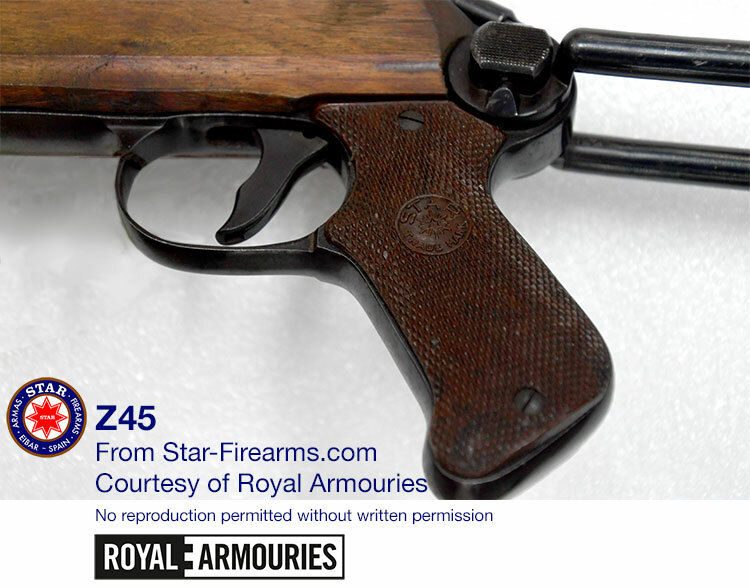 The Z-45 was the first evolution of the dual-control trigger carried through on the Z-62, which is still in service with the Spanish armed forces! These guns have no fire selector switch, but the trigger operates in two distinct modes. If the user places a single finger on the lower of the two notches, it rotates, and fires a single shot for each trigger press. If you instead place two fingers on the trigger, one in each of the notches, you can pull the trigger straight back, so it operates as a sliding instead of rotating trigger. In this mode, the gun is in full-auto mode and will continue firing until the trigger is released, or the ammunition is expended. There is no safety lever. The charging handle features are, as is typical on SMGs of this era, to be used as manual safety devices when needed. Immediately post-war, the world was awash in weapons. Many armies didn't re-arm, so much as consolidate the arms that happened to be in their country at the end of the war. Those that needed additional arms could get them for all but free on the world market. Many very cool, revolutionary weapons went nowhere, as there was no demand for them. So, you would assuming I am giving Star an excuse for why they weren't sold widely. But you'd be wrong. Somehow, aside from equipping the entire Spanish Army with new-made guns, they sold them in quantity to Chile, Cuba, Portugal, and Saudi Arabia. Smaller numbers were sold to numerous other national armies, police, and security forces. Due to the longevity of such overbuilt weapons, spreading sales on the secondary market, and the fact several thousand went to Cuba who switched to Soviet Block weapons after 1959 the Z-45 may be encountered almost anywhere in the world today. The markings on the gun I observed in the Royal Armories was for â€œCal 9mmâ€� which would seem to indicate 9mm Parabellum/Luger. 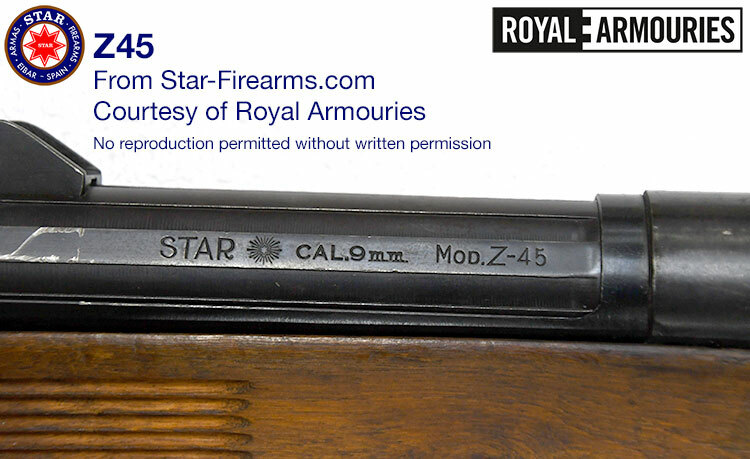 While there's not a shred of evidence that Star made 9 mm Luger/Parabellum guns in series production, much less for the Z-45, i can't rule it out. The cartridges are very similar, so a different chamber cut and perhaps change to the recoil spring is all that's needed. Many of the countries known to have purchased Z-45s did not otherwise use 9 mm Largo. While they might have lived with a caliber change for free or very cheap surplus guns, it's almost inconceivable they'd use a special cartridge for newly-purchased SMGs. Lastly, Star had produced the -35 Series in 9 mm Luger/Parabellum to demonstrate to the allies during the early war years, so clearly knew how to build such guns. Firearms marked 9 mm / 38 are designed to fire .38 ACP and 9 mm Largo ammunition, but NEVER .38 Super. Read more detail on ammunition for older pistols. I do not have manuals for every pistol shown on this site. However, in many cases there is a related manual. Partly to make the series relationships clearer, and partly to assist with speed and accuracy of updating, all manuals can be found in one place, the manuals page. All manuals available are provided as downloadable PDFs, or you may purchase a printed copy of the entire set of handgun manuals. I have no manuals for this series of SMGs. The stripping procedure can be seen, narrated in Spanish, in this video.